This article was first published on May 25, 2016, and updated on July 26, 2017. SINGAPORE - On Wednesday (July 26), the River Safari's animal icon Canola the manatee celebrated its third birthday. The manatee was presented with a 2m-tall cake made out of cabbage, carrots and sweet potato leaves, and celebrated its birthday alongside 60 invited guests. Canola was born in the River Safari three years ago, on Aug 6. Abandoned by its mother, the manatee had to be cared for by aquarists. During its third birthday celebrations, Canola also had a morning swim with the aquarist team from the River Safari. May 2016 saw Canola being unveiled as the River Safari's first animal icon. The role made the manatee a wildlife ambassador for all threatened wildlife, inspiring the public to protect the world's remaining freshwater habitats. Elephants are close relatives of manatees. Like the elephants, manatees have a relatively long life span of 60 to 70 years. 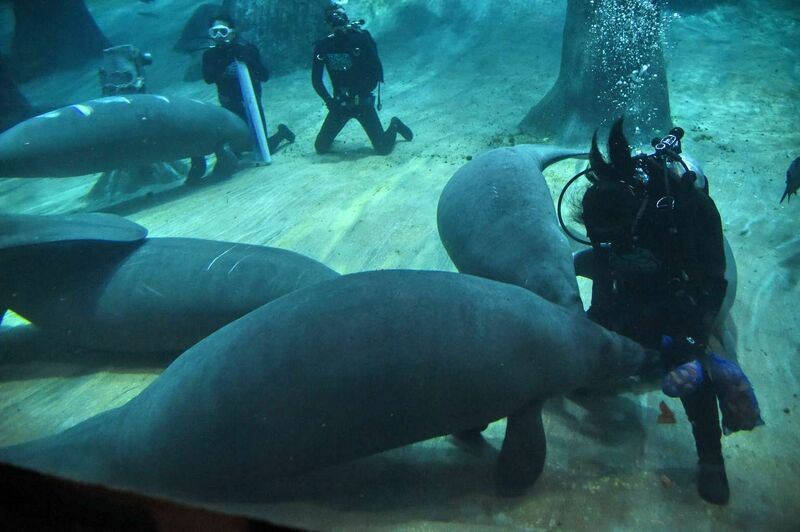 Canola's mother, Eva, is the largest manatee in River Safari's Amazon Flooded Forest, the world's largest freshwater aquarium. She stopped nursing Canola after she gave birth, and the aquarists had to step in. The 24-year-old Eva measures 3.5m in length and weighs more than 1,100kg. It sustains its size by consuming up to 100kg of vegetables a day. Canola, meanwhile, measures 2.16m in length and weighs 186kg. Manatees have six molars on each side of their jaw to grind food. Worn out teeth regenerate throughout their lives. Manatees are mammals, hence they need to breathe in air with their lungs. They surface every 15 minutes or so to catch a breath, replacing 90 per cent of the air in their lungs. Humans tend to replace about 10 per cent. The intestines of manatees measure up to 45m to cope with the large amounts of vegetables they consume daily. Manatees may look fat and insulated but the large body of the manatee is mostly made up of their stomach and intestines. Hence, they have little body fat to keep warm. They dislike living in cold waters below 20 deg C.
Manatees have no natural predators in the wild. Unfortunately, humans have played a large part in making them at risk of extinction. In the last century, their numbers have dwindled due to hunting, entrapment in commercial nets and collisions with boats. With an average speed of about 5kmh to 8kmh , manatees are too slow to escape from the path of a speeding boat. Presently, they are listed as Vulnerable in the International Union for Conservation of Nature (IUCN) Red List of Threatened Species. Manatees are herbivores typically found in shallow coastal areas and rivers where they like to graze on the sea floor and feed on sea grass. Hence, they are also termed as sea cows. The ratio of a manatee's brain to its body size is the lowest of any mammal. Manatees can learn basic tasks and differentiate colours. They are also very sensitive to touch. Hence, the hairs around manatees' mouths are used to find food. At the River Safari, aquarists are currently working with Canola on conditioning exercises in which it is trained to roll over for medical procedures such as injections and ultrasound scans. At the end of each manatee's flippers are three to four toenails. This feature is shared by the manatees' closest relatives, the elephants. To find out more about the manatees, members of the public can join Manatee Madness in River Safari on weekends from June 4 to 26. Activities such as a manatee mascot meet-and-greet, art and craft sessions, manatee feeding and a Q&A with aquarists are complimentary. However, admission charges into River Safari apply. Aquarists will demonstrate how they hand-raise baby manatees and work with Canola on conditioning exercises. Admission costs $18 per person and the tour is open only to those who sign up from May 31. For more information on Manatee Madness, visit http://www.riversafari.com.sg/events-promos/manatee-madness.html.